Dozens of men, women and children from Pakistan's minority Hazara community have held a protest in the city of Quetta demanding better security. The community has been frequently targeted by extremists from Pakistan's Sunni Muslim majority. Baluchistan Chief Minister Jam Kamal Khan Alyani condemned the attack, promising the "best possible" medical care for the injured, according to Pakistan news website Dawn. 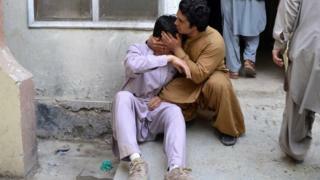 Amnesty International's Deputy South Asia Director, Omar Waraich, condemned the attack, saying: "This horrific loss of life is a painful reminder of the threats that Quetta's Hazara community continues to face. "Targeted for their religion by sectarian armed groups, they have suffered many such tragedies over several years. Each time, there are promises that more will be done to protect them, and each time those promises have failed to materialise."